If you have a pinstripe suit in your wardrobe. You will be a man who is known to have style. Pinstripe suits have been around forever but there is something special about the way pinstripes just look especially when paired with some Stacy Adams Shoes. Pinstripe pattern suits have the way of lengthening a man's appearance. These narrow style stripes give a short man height and the taller man power. They have a regal elegance that simply stands on it's own. Not to be confused with chalk stripe suits, Pinstripes are just that, stripes that aren't any wider than a pin. On some pinstripe suits, the pinstripes can become almost invisible, sort of blending into the dark contrast of the suit fabric. These are nothing like a Prom Suit that young men wear to the Prom. I prefer my pinstripe suits to be a bit more bold, the stripes more noticeable on the suit. I want my stripes to be seen in perfect symmetry. I want the pinstripes to guide the viewers eyes to fine details of the lapels on suit and the way it fits. That is what I look for in my pinstripe suits. 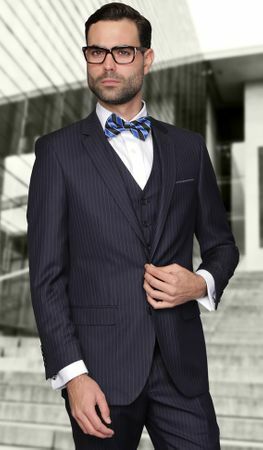 The pinstripes should always match up in the seams of the suit which is a sign of fine craftsmanship. If the stripes do not match up, it shows that the suits did not spend enough time being crafted. Now that doesn't mean the suit is going to fall apart on the you as you wear it, but it just doesn't give the suit justice when the pinstripes don't match up. These days you can find these suits in a whole array of variations from as said slight muted pinstripe to the bold variety which looks almost painted on. The bolder type will naturally get you more attention and might not be appropriate for the workplace unless you are in advertising or entertainment. The moderate pinstripe is the way to go for an office environment and comes in whole host of colors from navy blue to every shade of grey imaginable. Which ever way you go, Having some pinstripe suits in your closet will never let you down.